Many believe that liver cancer is caused by hepatitis B and C type viruses. Hence, people believe that hepatitis and the hepatic cirrhosis is the cause of cancer. Before liver cancer develops, it usually starts as hepatic cirrhosis. The result of the research such as that was announced at cancer academic societies and cancer remedy academic societies. When a certain food is taken more often for the liver cancer patient, the ratio of liver cancer born from the hepatic cirrhosis went down to half or less. Japanese medical research groups found that a certain substance in several foods we consume contains elements that reduce liver cancer risk for at least 50%. However, we cannot give you definite result but you can just think of it. You will be amazed if I say that it is in tomato and carrot. A piece of tomato and a piece of carrot a day is enough to reduce cancer risk. Aside from tomato and carrot, watermelon, oyster, squash, and spinach, are recommended for remedying cancer. How about a person who is more susceptible to lung cancer than others? There are many who smoke, but who do not develop lung cancer. There should be a good reason behind it. There are enzymes that can easily destroy our body's DNA. People who have this enzyme have more chances of getting lung cancer. Records show 40-45% higher risk. Of course there are cell mechanisms that can repair destroyed DNA. However, the destroyed DNA is usually surrounded by cancer cells preventing it from being repaired. There are people who take all necessary measures in life to ensure good health. Yet, there are many who contract cancer diseases. There are people who do not do anything in life to prevent sicknesses, yet, they remain healthy. The answer to those who get cancer disease is because their DNA repair genes had already been damaged, more often resulting to damaged DNA itself. We have grown up hearing the old adage "Prevention is better than cure". Prevention is better than treatment or remedy. So how do you prevent it? We, the PYRO-ENERGEN group believe that incurable diseases are caused by the negative energy. There is nothing more that makes people sick. Use PYRO-ENERGEN before you tumble: old proverb says "The stick ahead does not tumble". A teaspoon of honey before bed seems to calm your brain and help them sleep better, especially for growing children. Honey is also known as folk medicine for various treatments since hundreds of years ago. There are many kinds of cough medicines at nearby drugstores, but if you are taking honey every day, you do not need to buy such medicines at all. Honey can heal hundreds of diseases, and it prevents you from contracting hundreds of maladies. For decades, I've been using honey for coffee, cooking, and everything for meal. Our group have established honey farm in a rural area in the Philippines 20 years ago, although it does not supply enough to cover our entire needs, and it may remain as a hobby. Problems of high blood pressure, arthritis, diet, cancer, cough, influenza...you name it. Honey may be the answer for all. Of course, there are people who are against honey. They are just any other antagonists. Why don't you have a pedometer with you? It helps a lot for your daily health control and exercise. Many of us are lazy to do special exercises every day. Well you can do it simply by walking. 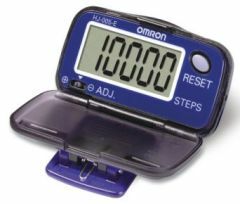 There are step counters that are integrated with heart beat and blood pressure counter, and other computerized health measurements. In Japan, pedometer is called Manpo-kei, which literally means "10,000 steps meter". Why do they call it Manpo-kei? I believe it's because we need daily exercise equivalent to at least 10,000 steps to maintain good health. 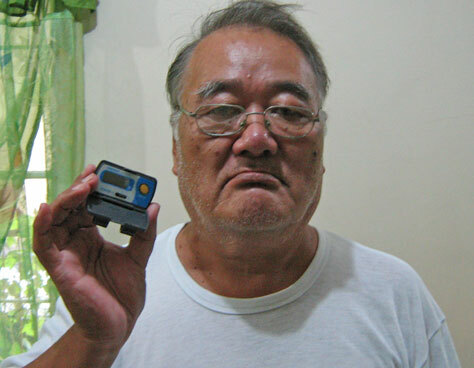 The above photo, Mr. Takano, the author himself with his pedometer. At 71 years old, I walk at least 8,000 steps a day. For less exercise or when busy, I do backward walking for about 500 steps, which is equivalent to 5,000 steps forward. 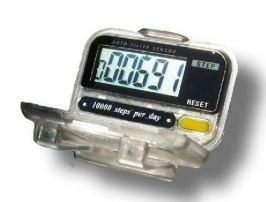 There are pedometers called computerized fitness counter available from various sporting goods dealers. It counts blood pressure, heart beat, breathing time, steps, and calorie consumption. Some of it even gives advices with a young sweet voice recorded. Daily exercise levels are measured with pedometer that calculates physical activity and its intensity. This idea is just one of the simplest ways to escape from aging. Yes, it makes everybody feel young and with good brain activity.